If you are reading this, you are probably on Facebook. Most of my blog traffic starts there and of course that makes sense to me because I have more friends/followers/connections there than anywhere else. So, since you probably have a Facebook account, you also probably have a friend or two who are “animal” people -- you know -- those who post photos of dogs that need adoption, cats who are lost, and even those horrible photos of animals that have been tortured and left to die. In April this year a puppy was set on fire by an 18-year-old man, Darius Ewing, here in the Dallas area. Ewing, along with a group of other idiots, reportedly laughed as he doused the puppy with lighter fluid and flicked his lit cigarette at the dog. When police arrived, the puppy was hiding and burns covered 70% of his body. 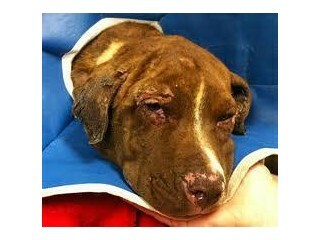 The puppy – later named Justice (pictured above -- photo courtesy of DFW Rescue Me) – ended up dying from his injuries. The story made national news. This story sickens me, as do all of the other stories of pets being tortured and abused. But I would be willing to bet good money that for every pet that is tortured, there is an equally disgusting act performed on a child. And I would also bet that most (if not all) of those assholes who hurt defenseless animals were once defenseless children being abused or watching it happen to their mothers and sisters and brothers. And I'd bet that if not stopped the Darius Ewings of the world will move on to torture women and children. Yes, it makes me sick to hear about animal cruelty and see it on Facebook. You should be glad that CPS doesn’t post what they see. My #FundraisingFriday gift is going to DFW Rescue Me -- the group that took in Justice.